Festive holiday fairies for your holiday designs. In bold Christmas green and red, they hold the spirit of the season. An African American version of each fairy is included. Create something beautiful that you’ll always treasure this Christmas. Not all are shown. The images in the promos have been greatly reduced. Create something beautiful that you’ll always treasure. 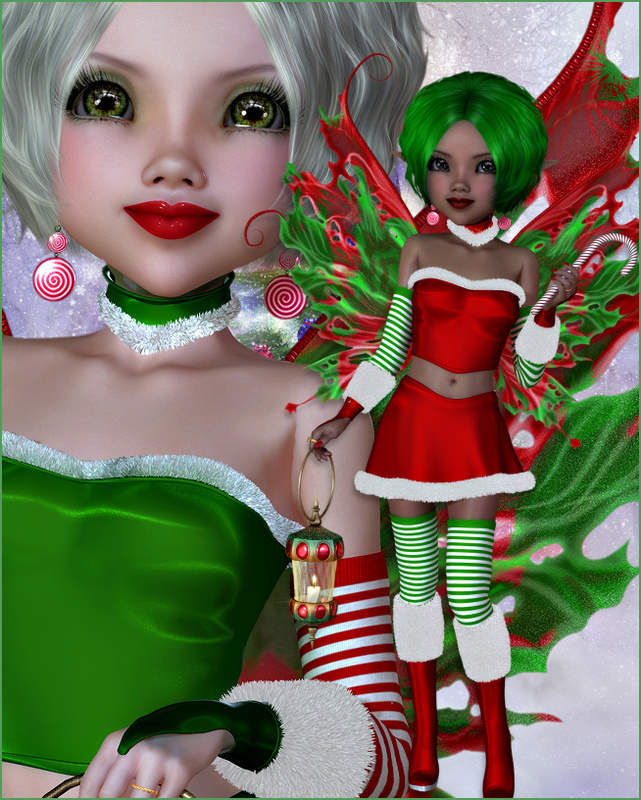 Holiday Candy Cane Fairy Graphics–lovely and festive fairies in bold red and green satin with fur trim. These fairies hold the spirit of the season. These will be great for the Christmas scene in your mind’s eye. Drop them into a winter background and create something memorable this holiday season. Or use them to embellish a scrapbook, tag, or other creative project. Wherever you use them, they will be nothing short of eye-catching. The adorable little holiday reindeer in the first promo image is from my Little Reindeer graphics package. This package has 30 holiday fairies in a variety of poses. They have no drop shadows. The size of these images varies, but they are about 1400 X 2500. They are 300 DPI, making them great for print projects. This package is two zip files, which are approximately 50-52 MB each.